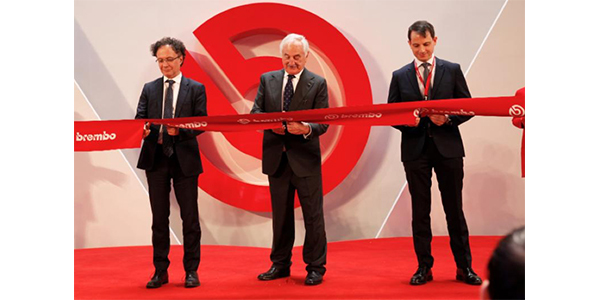 From left Michele Geraci, Undersecretary for Economic Development of the Italian Government; Alberto Bombassei, Chairman of Brembo S.p.A; Stephane Rolland, Chairman and CEO Brembo China. Having invested 100 million euros (approximately $112 million US), Brembo is supplying aluminum calipers and knuckles to plants belonging to its European, Asian and American customers operating in China. The hub integrates a foundry with production lines in a facility that stands next to the plant that was inaugurated in 2012 for the production of brake discs. The Brembo Group inaugurated its new production hub this week for the manufacturing of aluminum brake calipers in Nanjing, located in China’s Jiangsu province. 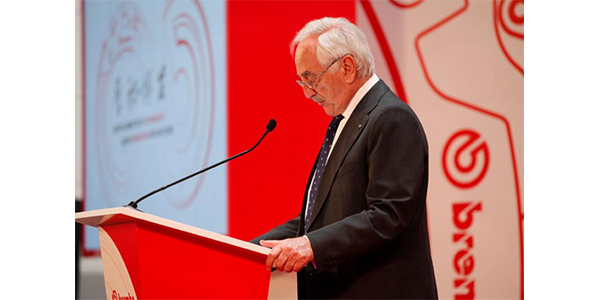 President Alberto Bombassei was there to welcome the distinguished Italian and Chinese authorities who were present. After nearly 20 years of operating in the Chinese market, Brembo has set up a new production hub next to the existing plant where brake discs are manufactured. The hub covers an area measuring almost 40,000 square meters. All of the production stages in the value chain have been integrated into the new site, from delivery of raw material to shipping the finished product. Doing so ensures better service for the factories belonging to Brembo customers in Europe, Asia and America that operate in Asia, the company stated. The plant contributes about 100 million euros (around $112 million US) per year to the Group’s turnover and employs 450 people. With 67 production lines, from calipers to knuckles, and the foundry, the facility offers a production capacity of more than 2 million pieces per year and adopts the most advanced technologies available today. Brembo says the new plant was built according to the most progressive criteria to guarantee quality, efficiency and environmental protection with an eye to minimizing waste and maximizing energy recovery by applying the strictest regulations imposed by the Carbon Disclosure Project protocol. Brembo entered China in 2001 with the formation of its first joint-venture. In 2008, it acquired the majority shares of Brembo (Nanjing) Brake Systems Co. Ltd., gradually reaching 100 percent control in 2013. In 2009, the logistics Aftermarket hub was established in Qingdao. In 2016, Brembo joined the Brembo Huilian (Langfang) Brake Systems Co.Ltd. JV as a majority holder with its partner SASAC. The Group currently operates in China with four different companies: Brembo (Nanjing) Brake Systems Co. Ltd.; Qingdao Brembo Trading Co. Ltd.; Brembo Huilian (Langfang) Brake System Co. Ltd.; and Brembo (Nanjing) Automotive Components Co. Ltd.